To perform an ssk, first slip two stitches, one at a time, as if to knit. The reason they are slipped as if to knit, and individually rather than together, is to adjust the stitch mount of the stitches. This will produce a slant that is the opposite of the k2tog decrease. The ssk can be a challenging decrease, especially for beginners. There are a couple of tricks that may help you. The first that I recommend is to use a Lifeline. you can see videos of how to use a lifeline here: How To Use The Lifeline. The other trick you can do, is after you slip the two stitches as if to knit, slip them back (this time, as if to purl, so the change in stitch mount remains) and then knit them together thru the back loop. This is the trick if the action of knitting them together on the right hand needle is too confusing. The M1 (make one) increase is also known as the 'pick up the bar' increase because you create a stitch out of the bar between stitches. If you are unfamiliar with the SSK (slip sip knit), you may want to use a lifeline on your knitting before attempting it. Knitting two stitches together (k2tog) is the most basic decrease stitch in knitting. K3tog just means to knit three together! The C4F (cable four front) is sometimes also called a T4F (twist four front). Depending on your pattern these may be different stitches. Circular needles have a plastic cord attaching two needles to create a circular shape between needles. They aren't just used in round knitting, however. They can also be used to hold very long rows like those in blankets. As soon as you notice a dropped stitch, try to put something in it to stop it from coming out further. 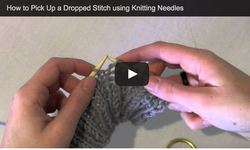 Then see this video for how to pick up the dropped stitches.